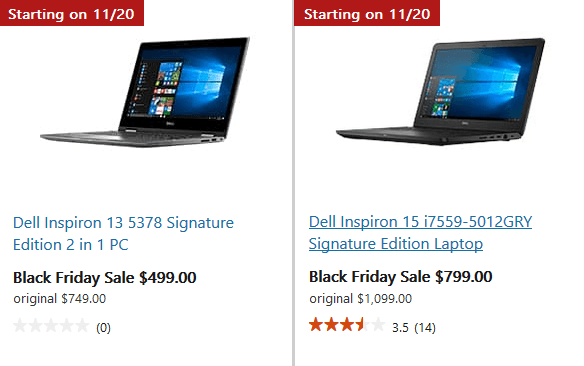 Black Friday is just 7 days away and if you’re looking to pick up some big savings on Windows devices this year, we have all the details. There are huge savings to be made on the Surface devices, the ultimate game console Xbox One S and Windows 10 PCs. Read on for the best Windows devices Black Friday Deals and savings. From Black Friday through Cyber Monday, you can get great really steep discounts on select Surface devices and bundles. The Surface Book with 128GB / Intel Core i5 will be available for $1499 as against the original price of $1899, giving you a savings of $400. The tablet that can replace your laptop, the Surface Pro 4, can be picked up for $799 as against the original price of $999. That’s a 6th Gen Intel Core m3, 128GB SSD, with 4GB RAM device you can get for $200 less. Give your kids the coolest gift this Christmas – an Xbox Console. You are guaranteed to get a $25 gift code, a $50 savings plus a free game. Plus, the devices start as low as $249. If you wish to add an extra dose of happiness, throw in an Xbox Live Gold membership for a $10 discount at $14.99. Also browse through the Xbox games collection, you can pick up discounts on games up to 50% off. For example, the blockbuster hit Gears of War 4 is cheaper by $25 as is the entire Gears Xbox 360 Collection. ReCore fans can pick up the game at a discount of $20. If you’re looking for a lighter and more powerful Windows 10 PC, you have a couple of great choices. The Dell Inspiron 13 5378 Signature Edition 2 in 1 PC (Intel Core i5) is only $499 as against $749. If you’ve got more cash to spend, the Dell Inspiron 15 i7559-5012GRY Signature Edition Laptop is available for $799 as against the original price of $1099. That’s a saving of up to $300. Gaming fans looking for a good deal can consider the Alienware 15 Touch Signature Edition Gaming Laptop. It is worth $2,499 but you can pick it up for $1,497. That’s an incredible saving of $1000. The laptop also includes a special offer of 9 free PC game downloads worth over $200. You can grab these great deals at exclusive Microsoft Stores or at Best Buy. Apart from these great deals, you can pick up Office suites, Xbox accessories, VR systems, and more at great prices.